So, what was seen over St. Norbert on Sunday, August 23, at about 11:00 pm? Thinking it was a city helicopter doing some spraying, I called the non-emergency 311 line myself. I simply wanted to know what time the helicopters were flying that night. The reply: "No flights were scheduled on Sunday night." Of course, that was ridiculous, since we clearly saw the helicopters flying along the ditches in the area. Stymied, I then emailed a media reporter asking him for help, since he does some work on crime and has good rapport with the police. His response after a brief inquiry with the same city 311 line was that there was indeed larvaciding going on that night. Contradicting what I was told, of course. However, he did not get details on the time, which to me is crucial to my investigation. I know there were helicopters in the area at 8 pm, but what about 11 pm? I tried calling 311 again. This time, I was told that a person from the insect control branch would call me back in a day or so. Meanwhile, I made an appeal on the radio, asking for additional witnesses to the event. I figured that someone else besides me must have seen the helicopters Sunday night, whether at 8 or 11 pm. The Winnipeg Sun newspaper carried a story on Tuesday about a major police operation Sunday night on the south Perimeter Highway, exactly where the UFO report originated. The police had been trying to crack down on drag racing on that stretch of road, separating St. Norbert from Fort Richmond. So that would explain why the police arrived so quickly after the UFO was reported. (Not that response time was slow at all.) The note I had received from the police said that the officers responded, took a statement, didn't see anything in the sky themselves, then left. That was the extent of the police UFO investigation. The next day, I finally heard back from the city's insect branch. He said that yes, larvaciding had taken place around 8 pm on Sunday night, but that after dusk, all flights were grounded. In other words, city helicopters were not responsible for the UFO seen over St. Norbert Sunday night at 11 pm. I called and spoke with the primary witness to the event. She was forthcoming and essentially reiterated what she and her son had seen before contacting her friend. I had asked her if she remembered seeing anything else odd in the sky at all that night. Aircraft, fireballs, satellites... anything. She said that they had not seen anything out of the ordinary. I find that particularly interesting, since the helicopters flying low would certainly have been a bit out of the ordinary. She did say that they had thought the lights were on a helicopter originally, but that because the object was flying so erratically and so close to them, they did not think it was any conventional aircraft. Besides, the city said that no copters (or light planes) were flying after dark. "If we can't see the water, we can't larvacide," the city employee explained. The question is, then, what did these three witnesses see? If they did not see a helicopter, then what was it? What about their physical effects? As a matter of fact, the witness told me that even days after the event, strange "energy" was still lingering in the house. The most obvious question is why others in the neighbourhood didn't report anything that night. There are a few hundred people in that specific area, and many more in the surrounding neighbourhoods. It was a nice enough night, many people would have been out. In fact, cars on the highway would have had a clear view, too. Had breakfast with the TV crew from Canada. They then filmed Stan, Donna, Kevin Randle and Peter Robbins. Peter was up first on the speaking schedule, talking about reasons why "disclosure" might not be a good idea, for political and/or religious reasons. I was up just before lunch. My talk seemed to be received well, and I got lots of kudos. Nice to know my presentation wasn't too dull. After lunch, Bruce Maccabbee spoke, then James Carrion. Then it was time for the ufology version of the "dead dog" - the speakers' panel when anyone could ask a question or offer a comment. Today started out with breakfast in the atrium. Didn't want to eat alone so invited a few stragglers to join us. First was a guy named Doug Dempsey (?) from out east somewhere. Very nice, keen guy, first time at a UFOcon of any kind, a school guidance counselor. An older gentleman joined us, told us his name but it didn't click right away. He was kind of a caretaker on a ranch in Utah, and was here as a guest of Bob Bigelow. His name was Junior Hicks. Then it dawned on me. This was the guy who did the original research and investigations with Frank Salisbury on the Uintah Basin cases dozens of years ago. Remarkable. This was fortuitous, because the first talk of the morning was by Frank Salisbury, who by his own admission was coming back to ufology after a 30-year absence! Great to see him and talk with him. He even discussed his view of the relationship of theology with ufology. Interesting. Then it was over to the vendor area where I sat for a while to talk with attendees and try to sell a few books. The ABC crew from 20/20 were there, interviewing Stan Friedman, Kathleen Marden and Stan Romanek, for a show to air August 18th (I think). Met some nice people from across the country. Lunch was a talk by John Greenewald on the Black Vault project, talking about this trials and tribulations of filing FOIA requests for UFO docs since he was 15. He has a half a million docs on his website now, or so. Sharp guy, entertaining speaker. Later in the afternoon was a presentation by Ted Phillips and his SIU team, about changes in trace cases since the 1970s. As I note in my talk, CE2s have all but vanished from ufology, but Ted has been doing some field investigation in Missouri where they have captured on film and video some amazing objects. In fact, I can say that whereas I have no trouble explaining most UFO videos on YouTube, I have no idea how the Marley images Ted has investigated and shot himself could be created. Curious. For dinner, we found fantastic Italian restaurant that served delicious scampi and veal, plus had a bonus wine-tasting special for dinner. We were still able to find our way back to the hotel. Finally, it was time for Kevin Randle's talk about scientific ufology. he made a good case for why studying UFO reports is scientific, despite what debunkers insist. He then described a skeptics' "experiment" in which they faked a UFO case to show how foolish UFO investigators really were. Even though MUFON investigators initially thought it was a hoax after talking with witnesses, it turns out that the hoaxers themselves pretended to be witnesses, giving false information which muddied the water and complicated the investigations. Skeptics announced that they had indeed fooled ufologists, but the truth was something different. One thing that was borne out throughout the conference so far is that ufologists are a whole lot more skeptical than debunkers give them credit for. In fact, the level of investigation and debate before reaching conclusions is at the forefront for serious UFO researchers. Furthermore, many take time to do field investigations, run comparisons, and examine the data in detail without prejudice, unlike many scientists who dismiss UFO reports out of hand without any consideration. Randle made the case in his talk that more ufology has to be unbiased and that ufologists should not jump to conclusions or interpretations... not answering or rebuting debunkers directly, but simply improving stardards within ufology. Now: sleep. I'm on in the morning. The day started off with a delicious breakfast in the Marriott atrium. They make a great Eggs Benedict. Darned good coffee, too. Met a nice couple who are MUFON reps from Nebraska. Then, we set up in the vendors area. It took a while to fill all the tables, but soon the atrium was full of people selling books, videos, clothing and trinkets, all with some UFO theme. I picked up a compass/flashlight combo and an official MUFON hat. Someone had also created a huge backdrop through which you could poke your head and on the other side it looked like you were an astronaut on the Moon standing next to an alien. My table with books was next to that of Kevin Randle, who had about 20 different titles of his books and CDs for sale. He introduced us to his wife, who rarely accompanies him to these things. Bruce Maccabee was way across the room, selling his science fiction novel about abductions, as well as CDs of his classical piano music. I didn't know he was actually known for that besides his UFO photo-analysis work. Stan Friedman and Kathleen Marden were at a table near the entrance, just down from a booth where someone was photographing your aura for $15. It was the only noticeably non-mainstream booth, if you don't count the guy who was soliciting Colorado votes on a Bill to create a UFO-friendly state. A woman who runs the abductee crisis line was nearby. There was also a guy who was selling handcrafted candy dishes in the shape of flying saucers, but he was asking $300 for each one and I passed them up. Around 11 am, it was time to participate in the MUFON press conference. There were a few TV cameras and several print and radio media, all local. Apparently, 20/20 had been there the day before, and the Discovery Channel and the History Channel were coming later. I was seated next to some big names: Bruce Maccabee, Stan Friedman, Kevin Randle and Ted Phillips. I wasn't sure what I was going to be able to contribute, as the topic of the conference was the 40-year anniversary of MUFON and how Colorado has fared in terms of UFO reports. I was therefore surprised to find that I was being asked to speak first. I had no idea what to say, but winged something about the international nature of the phenomenon and how UFO report data needed to to be gathered and studied more carefully. The others on the panel spoke, then some media asked questions, some of which were about Roswell. Kevin and Stan went to town on those. Then it was back to the vendor area. Fairly slow, but steady. Several who came by to talk were former air force or army something-or-others, with stories about seeing UFOs or aliens or both while on duty and they could only talk now they were out. Late in the afternoon, I was asked to show up at the benefactors' reception. I knew very few people in the crowd that was composed mostly of longtime MUFON members. However, Stan introduced me to billionaire Robert Bigelow, the aerospace developer who is now underwriting the STAR team of MUFON investigators. Seemed like a nice guy. He later showed up at my table and talked with me briefly. Stan Friedman gave the keynote address before dinner. He spoke on The Pseudoscience of Anti-Ufology, the premiere of this new presentation. It was about how scientists who debunk UFOs often resort to unscientific arguments and faulty reasoning. The dinner followed, during which a powerpoint presentation of notable ufologists was shown. Fellow Manitoban Grant Cameron's face appeared early in the presentation, and even me visage showed up at one point. After dinner there were awards and nods to many ufologists, and Bruce Maccabee was given the MUFON outstanding ufologist trophy. There was also a roast of MUFON founders Walt Andrus and John Schuessler, in a skit featuring John Greenwald and some MUFONites dressed as aliens and MIBs. Finally, we popped over to the bar for some mingling, then headed for bed. It's been a long day. We arrived in Denver around 10:30 am yesterday, August 6, and survived an hour-long shuttle ride to the Marriott. We then needed coffee desperately, since we had left Winnipeg at about 8 am and needed breakfast too. Of course, we missed breakfast so we went to a place called the Paradise Bakery near the hotel and had very good roast beef "sliders" that hit the spot. We then poked around teh hotel and found some UFO types, including Nick Roestler and Terry Groff, both Facebook buddies, and caught up on things. Since the conference registration isn't officially until Friday, we figured we'd go off exploring Denver in search of bookstores. Everyone kept telling us that we should go to one called Tattered Pages, but no one could agree on how to get there from the hotel. It took a shuttle, a train, a bus and a cab to find it, and it wasn't worth it. Sure, it's a nice retail store, but selection was nowhere near as good as McNally and frankly, we were expecting soemthing more. I picked up a nice pulp reprint of the fisrt two Doc Savage stories in print, though. We then were exhausted in teh 30C+ heat and decided to head back to the hotel, but noticed a store literally next door to the bookstore called Twist and Shout. Wow! We scored some major finds. I had never seen a Sun Ra CD bin as large as that. Donna found a remote-control zombie, some Day of the Dead parephrenalia, and I found a DVD copy of Plan 9 From Outer Space and a documentary about the Sun Ra Arkestra, post-Sun Ra, with a nice flying saucer on the cover. Lots of other stuff, too. Amazing collection of pop culture. We took two buses then a train to the hotel, held up by a power failure on the train because a huge lightning storm knocked the electricity out. After a brief shower, we went to the lobby and found Nick and others again. I talked with Kim Combs, the MUFON marketing exec who explained the layout for tomorrow. It seems that they are overwhelmed by the response. Pre-reg is over 250 and the are now expecting more than 500 attendees. 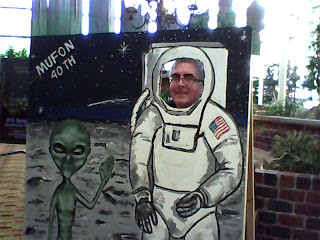 We went to the bar and met more MUFOnites, such as the MUFON rep from Florida (can't recall his name), and others from Pennsylvanis, Texas and a woman named Marlene from Oklahoma who said she had a photo of a cow in mid-air being abducted aboard a UFO. Then, it was off to meet Stan Friedman and Kathleen Marden (Betty Hill's neice) for dinner. We walked across to a Mexican restaurant called Garcia's which had great food and soon was taken over entirely by the UFO crowd. Dinner conversation flowed until it was time to go back to the hotel so I could dial in to the UMFM radio show Mysterious, co-hosted with Chris Reid, on which I would be interviewing Stan live on air. I appreciate his taking the time to do the interview as he and Kathleen had lots of things to do before the conference. Then it was down to the bar again to mingle with the UFO types. In a nook just across from the lobby, however, there were about 15 MUFONites in deep discussion about something. It turns out they were the STAR team, the ones who will actually be funded to go out and investigate UFO cases in depth as needed, largely at the direction of millionaire Bob Bigelow.